Mavericks 2004 Boys Black team headed to San Luis Obispo to play in the Summer Classic over the August 12-13th weekend. In their first competitive set of games since the spring season, the team returned home as champions. In extreme hot condition over the weekend the Mavericks boys came out to play! 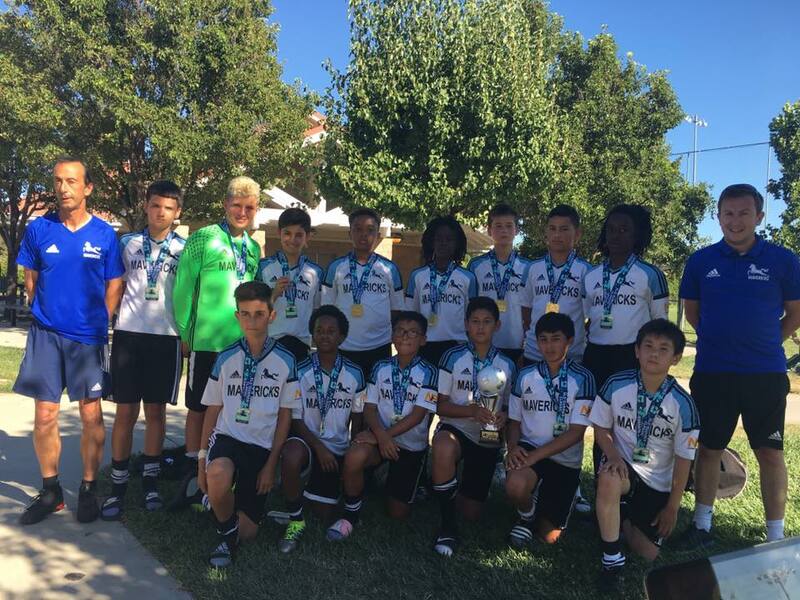 Saturday’s game saw 2 wins to Mavericks against Almaden Utd and Legacy 04 Boys. This set up a crunch game for early Sunday morning against LA Galaxy Bakersfield, with the winner almost certainly guaranteeing the tournament win. After a competitive 1st half the Mavericks team came in 1-0 down. The boys stepped onto the field for the 2nd half and quickly found themselves 2-0 down. However, players kept their head high and started to become more and more influential in the game. Mid-way through the second half after a prolonged period of pressure the Mavericks team pulled a goal back from a goalmouth scramble. After this, the players from Mavericks began to dominate possession and started making lots of good chances. On a resulting corner, Mavericks headed the ball into the net making the game a 2-2 tie. Unfortunately, time was not on their side and the game finished 2-2, this put Mavericks is a strong position only needing a win the last game to win the tournament. In a comfortable game, the Mavericks won the game and returned home as the 1st place winners. A great start to their fall season which will see the team enter the NPL 1 for the first time. This past weekend will give the team a good platform for the fall season.